It is proposed here a system of a Reverse Logistics Credits to assist companies in developing countries to meet their waste collection and recycling obligations. Reverse Logistics Credits are certificates which confirm that reverse logistics services were provided to ensure that a certain amount of waste was responsibly disposed of. These credits are issued and sold by independent waste collectors and purchased by producers and/or importers who need to comply with the solid waste legislation. Through the purchase of credits, companies effectively subcontract these waste collectors to provide reverse logistics services. 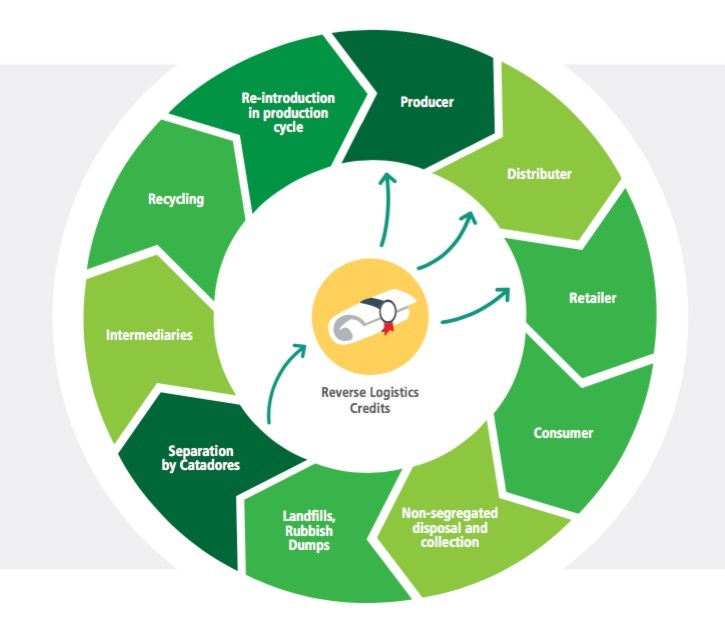 The use of Reverse Logistics Credits has the potential to become an important option for compliance with the obligations created by the Solid Waste legislation in developing countries. For the companies that buy them, the use of credits provides an efficient and cost effective solution to comply wit the law. For the waste collectors, the sale of credits would provide an important additional source of revenue, adding value to their activities and creating an important social impact. At the same time, the additional value generated by the sale of Credits would make it worthwhile to collect waste materials with lower intrinsic value, widening the range of products currently collected (for instance, today, only products that have high raw material value are collected, e.g, aluminium cans, whose recycling rate is over 95% every year, only possible through the work of independent waste collectors). 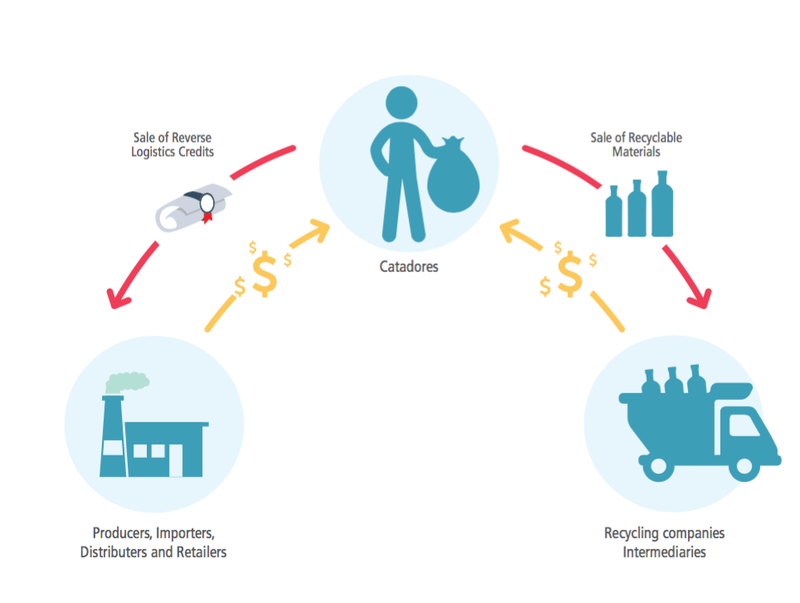 It is proposed here a system of a Reverse Logistics Credits to assist companies in developing countries to meet their waste collection and recycling obligations. Reverse Logistics Credits are certificates which confirm that reverse logistics services were provided to ensure that a certain amount of waste was responsibly disposed of. These credits are issued and sold by independent waste collectors and purchased by producers and/or importers who need to comply with the solid waste legislation. Through the purchase of credits, companies effectively subcontract these waste collectors to provide reverse logistics services. Solid waste management is a serious global challenge, usually concentrated in urban centres. Today, world cities generate about 1.3 billion tonnes of solid waste per year, and this amount is expected to double over the next 20 years in lower income countries. Globally, solid waste management costs more than US$ 200 billion, placing a financial burden on municipal governments that do not always have the resources to ensure the proper collection and destination of these residues. While most types of solid waste can be collected and recycled, recycling rates in developing countries are still very low. The remaining waste is landfilled, incinerated or remains uncollected, contributing to public health impacts and flooding, as well as air, water and ocean pollution. Failure to recycle waste also results in significant and unnecessary greenhouse gas (GHG) emissions. For many materials, the emissions generated by recycling are significantly lower than those from the production and use of virgin raw materials. BVRio’s Reverse Logistics Credit system was successfully adopted in Brazil as a market mechanism to incentivize the collection, separation and recycling of solid waste. Brazilian legislation establishes that producers or importers in selected sectors have to ensure that the products they sell are collected and disposed in an environmentally appropriated manner at the end of their lifetime. This obligation is called “reverse logistics” (Logistica Reversa) and is created by a Federal Law approved in December 2010 (referred to here as the Solid Waste Legislation). These obligations create challenges and concerns among those sectors directly affected by the legislation, given that they are very removed along the supply and consumption chain from the final waste generated from the products originally sold. At the same time, there are actors already specialized in the collection of waste materials and their recycling. In the case of the packaging sector, Brazil currently counts with over 800,000 independent waste collectors (i.e., the “Catadores”) that are active and interested in contributing to this waste management chain. The combination of these factors suggest that the implementation of this legislation will need to involve both the producers of waste as well as those involved in the collection, disposal and recycling. This can be accomplished by allowing the “sub-contracting’ of certain activities by those obliged to pay for the reverse logistics of their products (i.e., the producer goods retailing sector), to those currently involved in collection and disposal (i.e., in the case of packaging, the cooperatives of catadores). This sub-contracting activity, in turn, would work better if these activities could be disassociated from each other, avoiding direct negotiations between powerful and relatively less powerful groups. In this context, BVRio developed a system of Reverse Logistics Credits to assist companies to meet their obligations under the law while rewarding Catadores for their role. Reverse Logistics Credits are certificates which confirm that reverse logistics services were provided to ensure that a certain amount of waste was responsibly disposed of. These credits are issued and sold by cooperatives of Catadores and purchased by producers and/or importers who need to comply with the solid waste legislation. Through the purchase of credits, companies effectively subcontract cooperatives of Catadores to provide reverse logistics services. The creation of Reverse Logistics Credits requires cooperatives of Catadores to demonstrate that they have conducted this environmental service effectively. Cooperatives need to submit to BVRio (through the BVTrade platform) all documentation related to the waste collection, screening, weighing and sale of recyclable materials. The electronic receipt for each sale of recyclable material is main document to be uploaded, as this is an official document linked to the Brazilian Tax & Revenue system. For this reason, only official cooperatives, which have a Tax Registry Number (CNPJ), are allowed to participate in the system. This documentation is gathered in a management system developed specifically for this purpose. The management system reconciles the flows of waste through the cooperative (inputs and sales) with the electronic receipts, and issues Reverse Logistics Credits for each tonne of material sent to recycling companies. Once credits are issued, the terms of the transaction (price and quantity) are negotiated via an online trading platform created for this purpose. Each cooperative offers their credits for sale, at whatever price they choose. Companies registered on the platform can access these offers and make counteroffers until a settlement price is reached. Participants are anonymous on the platform to avoid direct negotiations between powerful companies and less powerful cooperatives. BVRio conducts the clearing of these transactions – i.e. once transactions are concluded, it collects payment from companies and transfers funds to the cooperatives while simultaneously transferring the credits to the companies. An online management system to help cooperatives track the volumes of waste received and recyclable materials sold. All information related to waste collection and separation, as well as to sales of recyclable materials and electronic invoices is collected. Based on these, the system calculates the results of the reverse logistics activities and issues credits corresponding to the amount of material recycled. Standard contracts for buyers and sellers to transact credits. These contracts were developed in consultation with relevant stakeholders, including the National Association of Catadores, producers and recycling companies. Criteria for participation in the market, to prevent ‘free-riders’ from opening accounts and selling credits through BVRio. In order to test the system and demonstrate a proof of concept, BVRio identified industry champions that agreed to pioneer its use, and provide leadership in their respective sectors. A pilot project (April 2014 – March 2015) was conducted with two leading consumer goods companies in Brazil: O Boticario in the cosmetics industry and biscuit manufacturer Biscoitos Piraquê. The companies bought Reverse Logistics Credits through the platform over the period of one year, to ‘neutralize’ the solid waste generated by their products, predominantly different types of plastics and glass. Once a demand signal appeared on the platform, cooperatives from all over the country started posting sell offers for the credits that they generate. While initially there was a large discrepancy in terms of pricing for the different types of credits (i.e. related to paper, plastics, glass, etc. ), in a short period of time clearer market prices appeared for the credits with fluctuations based on supply availability and competition. Very quickly, groups that typically are not accustomed to online trading became versed, wise and effective in their negotiating strategies with corporate counterparts. The concept of Reverse Logistics Credits has been successfully applied in Brazil, and the concept is proven. The system is ready to be used, and has the potential to provide a socially, economically and environmentally positive approach to waste collection and recycling in the developing world. In the case of Brazil, the use of Reverse Logistics Credits has the potential to reduce greenhouse gas emissions estimated at about 20 Mt CO2e per year. Similar calculations are required if applied to other countries. Reverse Logistics Credits have the potential to become an important tool for meeting the challenges of solid waste collection, screening and recycling. These credits can be issued and sold by the parties involved in waste collection, separation and recycling, and purchased by companies (i.e. producers and/or importers of consumer goods products) that need to conduct the reverse logistics of their products. Given that in the developing world these waste management activities are often performed by low income, informal waste pickers, this system has the potential to create positive social, economic and environmental impacts in many developing countries. 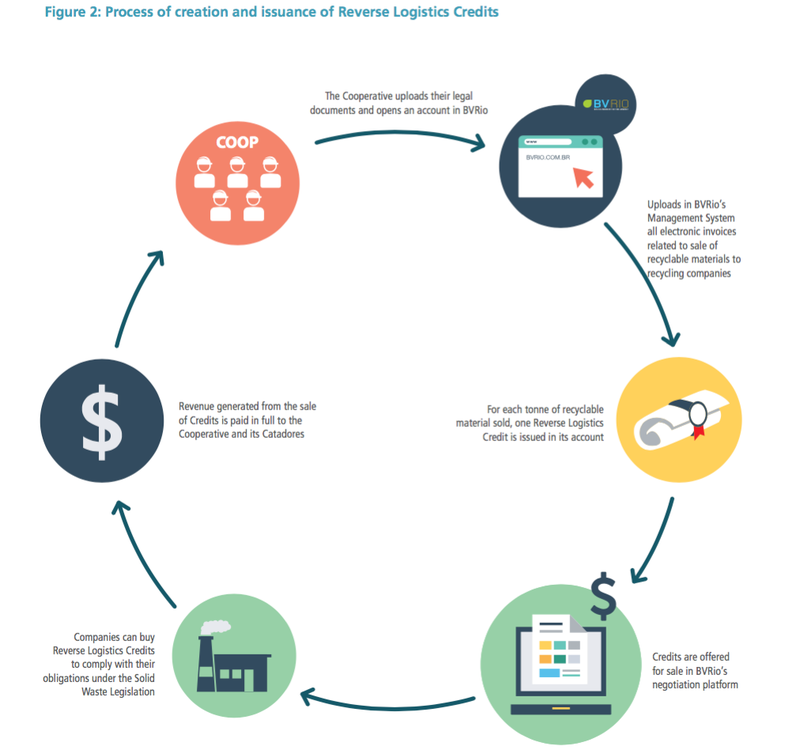 For companies, the use of credits provides an efficient and cost effective solution for their reverse logistics. For the waste pickers, the sale of credits provides an additional source of revenue, adds value to their activities and creates an important social impact. Environmentally, the additional value generated by the sale of credits makes it worthwhile to collect waste materials with lower intrinsic value, widening the range of products collected. Ease of compliance with the National Solid Waste Legislation, given that it is simpler and more cost effective for companies to contribute to the reverse logistics of their products through the use of credits than to create internal departments to deal with the new activity. It is expected that the benefits of specialization, comparative advantage, economies of scale, and trading will reduce the aggregate cost of compliance with the legislation for all parties. Creation of opportunities for social entrepreneurship and investment in a new economic activity related to the reverse logistics service industry. This would create jobs and support waste picker cooperatives, adding value and increasing income levels for more than 800,000 low-income people. Additional value creation for waste materials, increasing the range of waste types collected and recycled in a socially and environmentally beneficial manner. The establishment of a reverse logistics credit system for a new country is not a costly activity. And, if BVRio’s infrastructure and systems can be replicated elsewhere, resulting in significant cost savings. The adoption of the system, however, results in significant savings to companies, municipal governments. In Brazil, an initial trial involved more than 1000 Catadores (independent waste collectors) from 30 cooperatives in 7 Brazilian states that, voluntarily, responded to this demand for credits. Reverse Logistics Credits related to more than 1600 tonnes of solid waste were transacted during the course of a year, generating over US$ 100,000 of revenue for these cooperatives. The average price of the credits was US$ 45.00 per credit. Given that the demand was restricted to the needs of two companies, participating cooperatives only sold credits for about 4% of the total waste generated. If there was higher demand (with increased sales and possibly higher prices), the sale of credits could increase the income of individual Catadores by up to 50%. Note that the revenue generated by the sale of credits is additional to the value of sales of recyclable materials. The costs of reverse logistics using the credits system ranged from US$ 0.00013 to US$ 0.011/ per unit of packaging. These costs are very competitive compared to the costs of companies conducting reverse logistics in-house. Given their low cost base and distributed presence, waste collector cooperatives can provide reverse logistics services at very competitive costs. BVRio's Reverse Logistics Credit system is ready, the concept proven, and it can be replicated in any developing country. The establishment of the system, engagement of waste collectors and companies can be done in less than 1 year. This proposal was written by Pedro Moura Costa, Mauricio Moura Costa and Luciana Freitas, from Instituto BVRio. BVRio Institute (www.bvrio.org) is a non-profit association created in 2011 with the objective to develop market mechanisms to facilitate compliance with Brazilian environmental laws. iBVRio is a Climate Action Leader of the R20 Regions for Climate Action initiative, and received the Katerva Awards 2013 for Economy. BVRio was created in partnership with the Secretariats of Environment and Finance of Rio de Janeiro’s state and municipal government, and its governance structure includes representatives of the Brazilian Fund for Biodiversity (Funbio), the Brazilian chapter of the World Business Council for Sustainable Development (CEBDS), Brazilian Foundation for Sustainable Development (FBDS), Federal University of Rio de Janeiro (COPPE - UFRJ), E2 Socio Ambiental, the Instituto Pereira Passos of urban planning, and Pacto para o Rio.